Designed for use with Mode Air Freshener Dispensers, these fragranced refills refresh the room while neutralising unpleasant odours. Mode Air Freshener Refills are also environmentally safe, long lasting and economical, with each refill delivering 3000 metered releases. 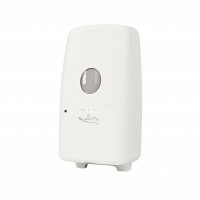 Mode Air Freshener Dispensers are a great air-freshness solution for washrooms, foyers, fitness centres, aged-care facilities, schools and public toilets. Put them in your place today – you’ll soon notice the difference. Baby Powder: This delightfully innocent, baby-fresh aroma relaxes and refreshes. Lemon: Breathe in the fresh citrus aroma of Mode Lemon - an energising boost for the body. Sandalwood: The distinctively warm, sweet, rich and wood tones of Mode Sandalwood satisfies and soothes your senses. Lavender: Sophisticated yet stunningly simple, lavender lifts the atmosphere and delights the senses. Vanilla: Softly sweet and irresistibly enticing, Mode Vanilla ensures a lasting, and unforgettable, aromatic experience. Green Tea: Bring peace and tranquillity into your life with the calm serenity of Mode Green Tea. Of all the senses, smell is one of the most important - and offensive smells are among the most dist..